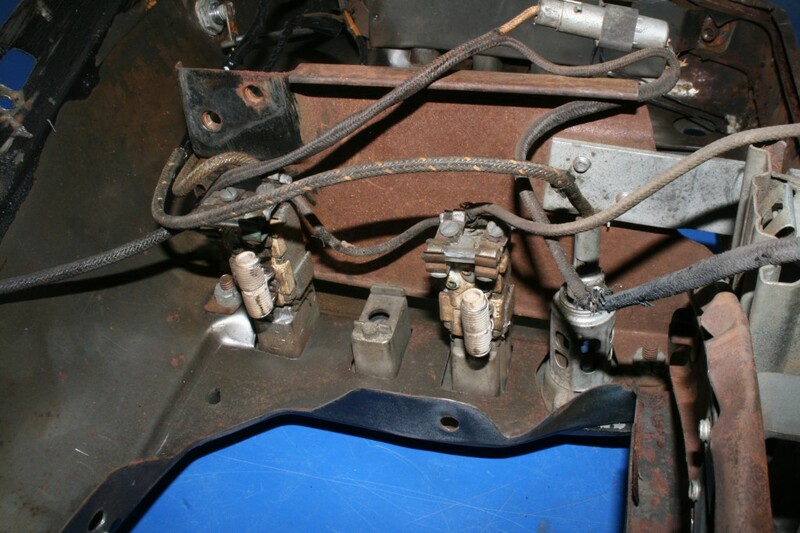 Ask most any car builder, restoration or otherwise, what the most difficult aspect of dealing with classic car and the answer is always the same, wiring. Chasing down shorts and open circuits has certainly caused more than one enthusiast to call it quits with a project. 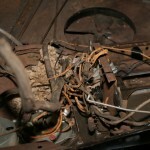 The problem is, the older a car gets, the worse the wiring situation becomes, especially when dealing with 50’s and older cars built with cloth-covered wires. 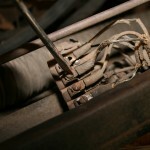 The biggest difficulty with cloth-covered wires is the cloth itself. As the material ages, it gradually becomes more and more brittle, which eventually leads to entire sections falling off. Not only does this not look good, it is an extreme fire hazard. It takes very little spark to set a car on fire, and the results are devastating. 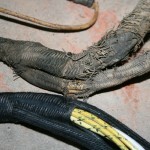 Once the integrity of the wiring is broken, the actually wire begins to deteriorate to the point that corrosion and fatigue breaks the wire, causing an open circuit, or worse and intermittent open that always springs up at the worst possible moment. 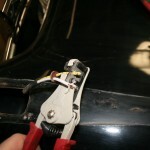 While the typical solution is repairing the original wiring or replacing it with a modern vinyl-covered kit, these options just leave the car looking hacked up or modernized, which detracts from the original look of the car. 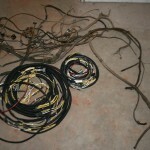 The best solution for a 100-percent restoration is a complete original-style wiring harness. These kits like the one we used here from Douglas B. Seybold, are built to the original factory specs, loomed in cloth, in the correct positions, lengths and locations, greatly simplify the installation. The best part about the kit we used (and most of the other kits that are on the market) is the wire used to build it is a vinyl-covered wire that is covered in correct-coded cloth. That means you get the best of both worlds, with a correct, 100-percent original quality wire that looks the part with added durability and safety of modern wiring. Even though these kits cost more than a retrofit wiring kit, for a true restoration, this is the only real solution. Kits can be found for just about any classic, considering we found a kit for a 1941 Buick, you should be able to find one for your classic. As with any project, this one requires a certain amount of skill. Even though the kit comes pre-terminated (the fitting s are already attached to the wires) for most applications, there are a few specialized connections that require some electrical knowledge. 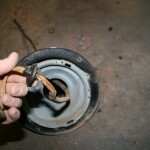 The turn-signal wiring for our 41 Buick required the reuse of the original bulb housing and the small round wafer board. The original wires were cut and removed, and the new wires slid in the holes, the new contacts were the crimped on and the restored assembly was reinstalled. You will need some specialized tools to complete the installation correctly. A set of high-quality crimpers (those combination crimper-cutter-strippers from Radio Shack are not high quality) from Klein (available at most hardware stores) are the best way to go for this project. Additionally, a quality set of wire strippers makes it easier to cut through both the cloth and the vinyl, leaving minimal cloth strays, which need to be removed. When starting a project like this, make sure you can have the vehicle down for a while. Even though the wiring project can be completed in a weekend, the level of disassembly alone can take a day or two. Unless you are an experienced automotive electrician, do not just go through the car hacking everything out and hoping you will remember it all later, attack each section at a time, removing the old wiring, installing the new section, removing the next section, etc. This not only keeps things fresh in your mind, but it simplifies the task in sections, which is a good idea as a lot of builders absolutely dread wiring and looking at a car without a stitch of wiring is panic-provoking. While the switches, circuit boards, and contact boxes are free of wiring, it is also a good idea to take a brass brush and clean the contacts. The environment under the hood of a car is not the best for wiring, water and fuel attack copper contacts, reducing their ability to conduct, which causes even more problems. If you find a really corroded and tarnished contact, a little baking soda\water paste will do wonders to clean up old contacts. 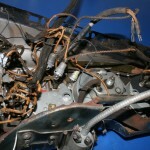 To show a few of these tricks, we re-wired a 1941 Buick Eight using a Douglas Seybold restoration wiring kit. Along the way, we removed the dash for restoration and found a well-hidden rat nest. All in a days work. 1. The project started at the front of the vehicle by removing the headlight buckets. 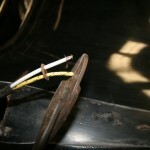 These wires are separate from the main harness and attach to a junction box on each fender. 2. 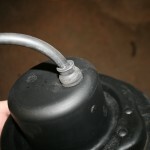 The harness has a molded rubber plug which keep water out of the bucket. 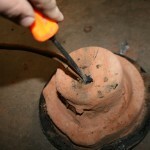 The past 65 years have hardened the rubber to the point that it crumbles when attempting to remove it. 3. The harness is removed from the bucket and thrown away. The new harness includes a rubber plug and headlight plug. 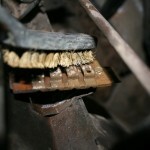 Now is a great time to clean up the bucket and remove any rust and repaint. 4. 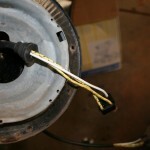 The headlight junction box on each fender had some really scary wires attached. Most of them were bare and could easily have set the car ablaze. 5. For photography purposes, we removed the entire dash (it needed painted anyways) and found a wonderfully preserved rat nest. The wires under the dash were simply clipped off. The kit comes with a diagram for each switch. 6. With the rat nest cleaned out, the dash wiring is still pretty scary. 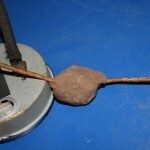 Most of these wires had sections that were bare and corroded. 7. This wasp nest failed to hatch at some point. Things like this really wreck havoc on an electrical system. 8. The wiring from each switch was removed. If the switches had problems, now is the best time to replace them. 9. 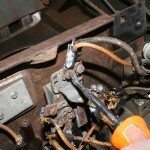 The final step in removing the old wire harness is the firewall plug. 2 hex-head screws hold the metal cap to the body. 10. The plate is split on the inside edges. Twist it off, then clean it up with a brush and repaint it with an appropriate paint. 11. With all the wires removed, we laid them out together with the new kit. This kit included the under dash and engine harness. The rear harness was separate and not included in this kit. 12. Here is a close up of the 2 harnesses. 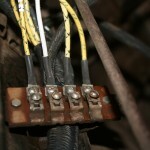 The new harness is identical in the use of material and wiring codes. 13. 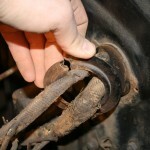 The engine harness is run through the body plug and the original rubber bushing was re-used. 14. The refurbished metal plate was then reinstalled using the original screws. 15. 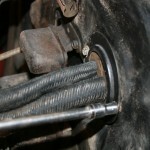 The harness was then reinstalled using the original body clips. 16. 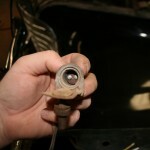 The headlight junction box was cleaned up with a little baking soda and water. A brass brush does wonders to get the little nooks and crannies. 17. 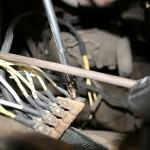 The headlight and turn signal wires from the main harness are mounted on the lower portion of the junction box. 18. 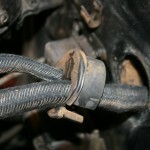 The headlight harness includes a new rubber plug which requires installation before the wires are run through the fender. 19. The harness is run through the bucket. The harness has a new OE-style plastic headlight plug already attached, which makes things simple. 20. 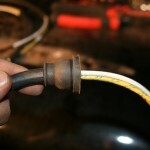 The new wiring has a rubber sleeve covering the cloth wire. This protects it from the harsh environment as this car does not have any inner fender covers, the wire is exposed to all everything the tires are. 21. The turn signals are a little tricky. The wafer board inside the housing must be reused. 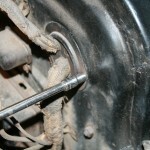 A small pick or screwdriver pops it out of the housing. 22. The wafer board and spring are very important, don’t lose them. 23. The wires twist through the wafer board with little effort. 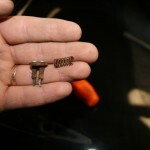 Then, using a set of quality strippers, the wire is stripped about an 1\8” so very little wire is left bare. 24. Then the small contacts are crimped on. 25. 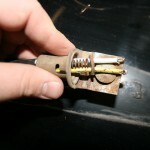 Do not forget to slide the wires into the bulb housing BEFORE installing the new terminals. Lay the spring inside and press the wafer board back into position. 26. With all that done the headlight wires can be mounted to the junction box. 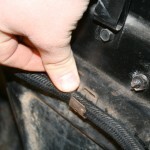 Don’t forget the ground wire, which attaches with a hex-head screw. 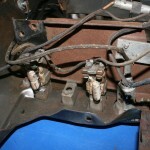 Once you have completed this stage, the under dash wiring is plug and play. Each kit comes with diagrams and schematics to simplify the installation. Nice article & photos. how long did this project take? Thanks! We spent about 2 days working on this car. Depending on the condition of the car, and how put together it is makes a difference. The Buick we worked on was an older restoration that wall together except for the seats. Make sure you check out some of our other tech stories.